The New York Times printed this interesting graphic comparing the costs of different versions of a meal for four: a fast-food meal from McDonalds, a homemade chicken meal and a homemade rice and beans-based meal. 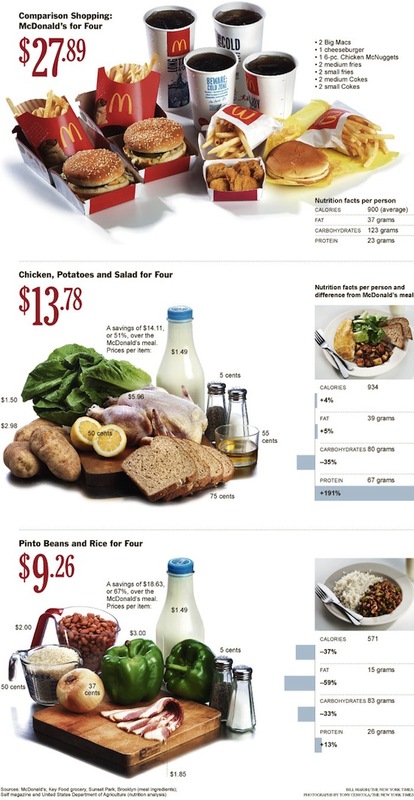 The graphic shows that the non-fast-food options are not only cheaper, but on the healthier end of things. Not to rain on any parades, but the info-graphic may be a bit misleading, as it leaves out a few integral pieces about the homemade meals. Purchasing the food requires that one has the ability to get to a grocery store; whether via foot, auto, or public transport, such food needs to be accessible. The food pictured assumes that you could purchase the ingredients as is, however can you really buy two slices of bacon, a cup of dried beans, or four slices of bread? Finally, homemade meals take time - time to go to the store, time to cook and time to serve. From store to table, a homemade meal certainly takes a bit more time. Still, this is a useful graphic to begin to dispel the myth that fast-food is the cheapest way to eat. With some planning ahead, we can eat healthier meals at lower costs. Thanks New York Times! Good point about the accessibility of real food (think about food deserts) and the practicality of eating this way. While eating healthy is not a privilege of the wealthy, it is certainly easier. Yes - thank you! I was alluding to food deserts - places where fresh foods are unavailable or difficult to get. And you're right, it is generally easier for the wealthy to eat healthy, but it is not all about economics. In some sense, I think this is an informative graphic, but it also glosses over a number of equally important issues, some of which I mentioned in the post. To be fair...all three meals require transport as you have to be able to get to the McDonald's as well. I do agree with the other points that the graphic leaves out. Hey Tender - you are right on some levels about needing to be able to get to a McDonald's as well. However in many low-income areas (whether urban or rural), there is often easier access to some type of fast-food, whether it's from a restaurant like McDonald's or Checkers - or from a quick stop corner store or gas station convenience store. I think this point is lost with this graphic - by naming McDonald's explicitly, the viewer/reader may not transfer that meal to other "fast food" examples.